Current Status: merged with Montacute Lodge to form Guiding Lights Lodge, 08/23/2003. I am not going to attempt to give you a history of Athelstan Lodge, but I am going to recall some of the events that have happened during my forty years of membership. In this little personal touch I will try to avoid saying "I" as much as possible. May 12, 1865, Athelstan Lodge was born in Worcester. In a month lacking a day, June 11, 1865, I was born in the town of Webster, only sixteen miles from Worcester, so that you see our birthdays are close together, and this anniversary, May 22, is about as near my birthday as that of the Lodge. When about ten years of age I saw my first Masonic Funeral, held in the Methodist Church in Webster. As the Brethren formed a procession to march to the cemetery, which was the custom at the time, I was so impressed by the caliber of the men in line that I decided that I wanted if possible to sometime become a member of the organization. Twenty-five years later, June 27, 1900, I was raised, signed the By-Laws and became a member of this Lodge. In December of that year, I was installed in my first office as Marshal, and in December 1907 as Wor. Master. During my years of membership I have been privileged to be present at every one of the Annual Meetings, every Official Visitation as well as every Installation of the Lodge. One thing I shall always remember was the first Installation Ceremony, which was in charge of Rt. Wor. Henry Goddard, the first Master of the Lodge, and it was the last time that he ever performed that duty. As we go past and see his picture on the wall, all he did and was comes back to those of us who knew him. At the time I became a member there were living seventeen Past Masters; only one of the number is now living, Wor. Arthur W. Macomber, who is present with us tonight. I was personally acquainted with all of them and can say to our members that we have every reason to be grateful to them for the wonderful work they did in carying on the affairs of the Lodge, at a time when there was not much money to work with, and plenty of hard work was necessary to make such plans as it was possible for them to do, to make the future of the Lodge a success. When I joined in June 1900, the membership was about three hundred and fifty. On Sept. 1, 1939, the membership was about one thousand and eight. Lodge dues in 1900 were $3.00; then $5.00 and now $8.00. Life membership in 1900 was $30.00; then $50.00, $75.00 and $100.00. It is now $120.00 or fifteen times the Annual Dues, eligible after the payment of five Annual Dues. The interest from all funds is paid into the current funds for the purpose of carrying on the work of the Lodge. Through careful and efficient management, the finances are such as to enable the Lodge to take care of its own charities, and doing things to make it interesting for the Brethren; also to take care of the Service work which is now a matter of considerable expense. Dispensation granted to institute lodge-May 12, 1865 by Grand Master William Parkman. Charter granted by Grand Lodge of Massachusetts in June 1856. Lodge constituted and consecrated under charter, July 6,1866.
father of York Rite Masonry. First Worshipful Master - Henry Goddard, Past Master of Morning Star Lodge and charter member of Montacute Lodge, served in 1866. Present Worshipful Master-Walter D. Pierce. First meeting under dispensation in Montacute Hall, Foster Street, May 24, 1865, in building now occupied County Electric Company. First Master elected by Lodge under its charter - Samuel Bigelow, May 31, 1866. Senior Past Master - Arthur W. Macomber. First Lodge to hold regular meeting in new Temple on Ionic Avenue. Ernest F. Maynard, Past Master of Matthew J. Whittall Lodge, made a Mason in Athelstan Lodge May 28, 1919, and elected an Honorary Past Master. Sept.3, 1914. Athelstan was the last Lodge to confer a degree in the Pearl Street apartments. There were present at the fiftieth anniversary about 250 members. The membership at that time was about 500. Athelstan also had the honor of having one of its own members, the late Wor. Bro. Halcott, design and superintend the construction of the Temple which will always remain a tribute to his skill and ability. He was also the first Master to serve the Lodge in that position in the new Temple. As I look back over my forty years of membership, one of the outstanding things to me is the wonderful support given the officers at all times by the members and Past Masters. I am sure that no Lodge anywhere ever had a more loyal lot to work with than has Athelstan. Harmony, which is the strength and support of all organizations, has been an outstanding feature in the Lodge, for during my forty years of membership nothing has happened to cause any trouble that would mar that harmony. Our charity fund provides for our charities which are taken care of with understanding and sympathy. Our service department looks after all cases as soon as we hear about them. Flowers or fruit are always sent to the sick as well as to those in sorrow or in trouble. At Thanksgiving and Christmas members needing assistance or something to cheer them up and to help make the day pleasant, are sent a basket containing a turkey and fruit. As chairman of the committee, I know by personal contact that they do much good. Regular calls are also made on the sick and shut-ins at home or in hospitals. The Lodge has several times, at the request of the Grand Lodge, performed funeral services for Brothers from other states who died here or who were brought here for burial. We feel that we have done our part in carrying on the Lodge of Instruction, for during the few years of its existence two of our Past Masters have served four years as Master, as well as taking part in the duties in connection with the work. In the work of the Ritual, we aim to keep it at a high standard that_will always satisfy the Brothers and merit the approval of the Grand Lecturer. As I look back over the years I find that the social life has made much progress. We try to give our members entertainments and social life that is clean and enjoyable: pitch parties after our regulars for members of the Fraternity, and entertainments usually after the F.C. degree. Twice a year we entertain the ladies; once with a Ladies Night, Banquet, Entertainment, Souvenirs and Dancing for which a reasonable price is charged; and a members' night which is about the same with the exception of the banquet which is free, a member being entitled to two tickets. During my forty years of membership the Lodge has grown greatly in membership, having had many successful years, and like the Fraternity everywhere making large gains after the World War. We are not sure that large numbers are for the best interests of Masonry. Perhaps a normai growth is better. During these years which have past, we have lost many of those whom rn'e loved and respectet, as Wor. Bro. Frank E. Sessions, Treasurer for 27 years, who more than any one person laid out the plans that have enabled the Lodge to attain its present financial standing. It was Wor. Bro. Sessions who raised me in 1900. Bro. Fred Knight, who was Secretary for 42 years; a fine and faithful Brother who loved to serve Athelstan Lodge; and those others whose devotion helped to make the Lodge what it is today. We will not forget Henry Flint who so faithfully served all the Lodges for over 45 years. I could talk with you a long time about what has happened in Athelstan during my forty years of membership, having been installed in office twenty-seven times and having served at least ten years in other positions, but I fear I may have already tired you and so will keep the rest for the centennial anniversary. by Worshipful Herbert S. Bull. Freemasonry first came to the American colonies in 1733 with the birth of the "First Lodge of Boston." It came to Worcester in 1793 with the founding of Morning Star Lodge, Ancient Free and Accepted Masons. Isaiah Thomas, well known Revolutionary War patriot and a printer for freedom, was Master of the city's first Masonic brotherhood. As our nation grew'—and this city—other lodges rose in strength and repute. Montacute Lodge became the second in Worcester, organized in 1858. Then, on May 12, 1865, our lodge, Athelstan, was instituted. Now we are 100 years old, and one of a total of seven brother lodges within the city. We have grown, our roster today lists over one-fourth of Worcester's Masonic population, 1,166 members, the largest in the city and in the Grand Lodge of Massachusetts. We are part of the whole, but born of another. The 30 original members who signed our charter came from Montacute Lodge. And, as with other Masonic lodges, now, and yet to come, we are a cross-section of Worcester, men of all ranks, men of civic, professional, educational, industrial and commercial trades, of integrity and character, fostering Masonry's purpose, belief in the Almighty, charity, and truth and brotherhood of man. In the Beginning, a petition was signed by 30 Master Masons, asking dispensation to form a new lodge, "Athelstan." It was presented to the Grand Lodge of Massachusetts and approval came on May 12, 1865. The first regular communication was held on May 24, 1865, with five elected officers: the Worshipful Master, Senior and Junior Wardens, Treasurer, and Secretary, all approved by the Grand Lodge. The remaining seven officers were appointed to their posts. Right Worshipful Henry Goddard, first Master of Athelstan, was born in Worcester in 1823 and was manager of the wire works of the Washburn and Moen Company for many years (this later became a part of the American Steel & Wire Co.) Of English ancestry, he was active in city affairs; he served on the Common Council and as Alderman. He was Master of Morning Star Lodge for three years, and Eminent Commander of the Knights Templar, a member of the Massachusetts Consistory, 32nd Degree, and highly active in securing a home for all city Masonic bodies. He died at age 81. It is an interesting note that his father, Benjamin Goddard, an outspoken opponent of Masonry who believed that the order interfered with the church and state, won election to the Massachusetts General Court for his stand. Once he knew of his son's sympathies, he never again uttered a word against Masonry. On July 12, 186S, in shared quarters, Montacute Hall on Foster Street (later occupied by the Massachusetts Electric Co. and now by the Worcester County Institution for Savings), the first entered apprentice degree was conferred. The candidate, James F. Kettell, after proper instruction, gained his Master Mason degree on November 8, 1865. James F. Kettell, born in 1834 and educated in Worcester, was associated with his father, John P. Kettell, a dealer in "hats, caps, furs and gloves" at the corner of Main and Foster Streets. He was later a manufacturer of "speed indicators." His son, Henry James Kettell, became a wholesale grocer, an associate in the firm of Johnson & Kettell. James Kettell died in 1885. Meetings continued and on May 30, 1866, new officers were elected. On June 13, 1866, the charter was issued by the Grand Lodge. On July 6 of the same year, Grand Master Charles C. Dame and his suite constituted and consecrated Athelstan Lodge in Montacute Hall. The name "Athelstan" meaning "Noble Stone" is the name of a King of England, a favorite grandson of Alfred the Great. In 925, he was the first ruler of the entire island, a man interested in his people, improving laws; a man who fostered builder's guilds, built monasteries, and was called a just king, "The Glorious." He lifted social conditions and brought England in close touch with continental Europe for the first time. In history, his name was written in several ways. There is one other Masonic Lodge in New York State which bears his name, spelled with an "E" Athelstane. On September 9, 1866, Athelstan officers attended their first Grand Lodge meeting in Freemason's Hall, Boston. Shortly thereafter, representatives of the lodge joined over 12,000 other Masons, including Andrew Johnson, President of the United States, 1865-69, at the dedication of Boston's Masonic Temple. Athelstan's first home, Montacute Hall on Foster Street, served all three lodges until June, 1867. Then, Morning Star, Montacute and Athelstan moved to Pearl Street, remaining there until 1914. On September 3, 1914, along with all city Masonic bodies, our lodge moved to the new $200,000 Masonic Temple, our present home on Ionic Avenue. The building was designed by an Athelstan Brother, architect George C. Halcott, then Worcester's Superintendent of Public Buildings. It was built to fit the prestige of the organizations it housed: 70 feet high, in symbolic Grecian, Egyptian and Gothic design. It was financed, in total, by personal, unconditional subscriptions, without any overtones of publicity, within a short period of time. On that day, a procession marched down Summer Street to Lincoln Square and back along Main Street where Mayor George Merrill Wright, a member of Athelstan Lodge, and members of the Grand Lodge were in the reviewing stand. The Hon. Samuel Winslow (1886-7-8-9) was a state senator, inventor, skate Manufacturer and promoter of local street railway systems. The Hon. Francis A. Harrington (1890-1-2) was a state senator, active in the Grange and Odd Fellows, and co-founder and first president of The Masonic Protective Association, now The Massachusetts Protective Association, and insurance firm. The Hon. Pehr G. Holmes (1917-18-19) went on to serve in the United States Congress, from 1931 to 1947. The Hon. Walter J. Cookson (1936), holder of many city elective offices, rose to become the 38th mayor, but served only five months, collapsing of a heart attack in Cleveland, Ohio, while attending a Republican conclave. He was inaugurated on Jan. 6, 1936, and died on June 11 of the same year. Still with us is the Hon. William A. Bennett (1938 to 1945). He left the Mayor's duties to serve as Worcester County Sheriff until 1963. Councilor Andrew B. Holmstrom, former Vice-President of Norton Company, was Mayor from 1950-1953; the first under the Council-Manager system of government. Athelstan Lodge flourished. At the end of 50 years, the membership numbered approximately 500. In 1920, according to Right Worshipful Alfred E. Rankin, 125 new candidates were processed, many of them home from the war, the largest group in any one year. In 1940, at the 75th anniversary, posthumous recognition was given to Frank E. Sessions, Master in 1900, who served as Treasurer for 27 years, and to Fred Knight who held the Secretary's post for 42 years. Funds are channeled for specific purposes, expenses and charity, to maintain the Temple and the many unpublicized humanitarian deeds of the lodge itself; and to the Grand Lodge, contributing to support of state-wide charitable projects including the Masonic Nursing Home in Shrewsbury, and the Masonic Home in Charlton. Athelstan's Blood Program under the direction of Worshipful Frank B. Tattersall has steadily increased in the past five years, rising from 151 pints in 1960 to 344 pints in 1964. During the years, 1961, 1962 and 1964, local donations topped all other state lodges. In 1963, Athelstan ran a close second to Paul Revere Lodge of Brockton which set an all-time state record of 352 pints. Today, six of the 16 Honorary Members of the Scottish Rite Supreme Council, 33rd Degree, of the Valley of Worcester, are Athelstan Lodge members. They are Brothers Frank C. Harrington, Harry G. Stoddard, Alfred E. Rankin, Leo P. Gelinas, Frank L. Harrington, and Malcolm P. Gould. We also honor, in this 100th year, our two oldest living Brothers. Our Senior Past Master is Frank C. Harrington, 89, of 12 Monadmock Road who was Master in 1905. He has been long active in civic and fraternal life, and is still serving on the boards of the Massachusetts Protective Association and the Paul Revere Life Insurance Company. Our most senior member is Peter Bundgaard, a former horticulturist, aged 93, a resident at the Goddard Home. He became a Master Mason in 1925. Also, on the occasion of this anniversary, we pay tribute to three other members who have seen half the life of Athelstan Lodge. Fifty-years medals will be presented to Ernest Ludwig Anderson, Irving Brown Barrows and George Edwin Taylor. The history of the first 100 years of Athelstan Lodge is documented on page 249 of the Proceedings of the Grand Lodge of Massachusetts 1965. The following are highlights of the events of Athelstan Lodge which occurred over the next 25 years. 1970 - 33 members of Athelstan were eligible to receive 50-year Veteran's Medals, which were presented by Right Worshipful Milton Schultz on April 29 and September 16, 1970. This number indicates the number of candidates admitted following World War I.
June 27, 1973 - Visitation of Most Worshipful Donald W. Vose, Grand Master, accompanied by Most Worshipful Thomas S. Roy, Past Grand Master, Right Worshipful Oliver Rutherford, Right Worshipful Clayton Fisher, Past Junior Grand Warden, Right Worshipful Charles A Cross, D. D. G. M., and Right Worshipful Arthur Rockwell, Grand Marshal. A Citation was presented to Athelstan Lodge for outstanding participation in Masonic Blood Program. Citations have been received every year since 1960. March 5, 1975 - Visitation of Most Worshipful Stanley F. Maxwell, Grand Master, to present two 75-year bars and five 50-year Veterans Medals. Right Worshipful Frank C. Harrington's 75-year bar was presented to his son, Brother Frank L. Harrington, and that of Brother Lebaron Fox was subsequently presented by Right Worshipful Richard W. Stake, D. D. G. M., and the Master and Wardens of Athelstan Lodge. A 50-year Veteran's Medal for Brother Peter Bungard, 104 years old, was presented at Hahnemann Hospital by the Grand Master, accompanied by Right Worshipful Brenton Tyler, Grand Marshal, and the Master and Wardens of Athelstan Lodge. Most Worshipful Maxwell also presented Right Worshipful Malcolm P. Gould with the prestigious Joseph Warren Medal for distinguished service. 1981 - Right Worshipful Carl R. Bohn was appointed District Deputy Grand Master for the Worcester 22nd Masonic District. New Grand Master, Most Worshipful J. Philip Berquist, visited Athelstan Lodge on June 3rd to present a 50-year Veterans Medal to our Tyler, Brother John H. Gannon. May 19, 1982 - Visitation of Most Worshipful J. Philip Berquist, Grand Master, who assisted in presenting Veterans pins and medals, and also presented the Joseph Warren Medal for distinguished service to Worshipful Richard J. Stewart. So . . . a century and a quarter is behind us, and we move on. I. S. D. W. Knowlton. his excellent and prosperous Lodge , entertained their ladies and a large assemblage of invited guests at a grand promenade concert and ball at Mechanics' Hall, Worcester, on Tuesday evening, March 25th. The music was furnished by Gilmore's Band of Boston, and was of course of the highest character. The brethren appeared in full regalia, and the hall being tastefully decorated, the tout ensemble was all that could be desired. The occasion was probably one of the most attractive that has ever been held in the country. with a Proclamation denoting May 9, 1990 as Athelstan Lodge Day, and a key to the city. Although the hostilities of fighting the American Civil War had ended by May 12. 1865, the effects would not cease for another 100 years, during which time Athelstan Lodge was chartered in Worcester with Henry Goddard as the first Master. A letter of congratulation was sent from the White House and a flag that had been flown over the Capitol in Washington. D.C., was presented to Wor. John W. Hanson as President of the Worcester Masonic Charity and Educational Association. Veterans" Medals were presented to R. W. Malcolm P. Gould, Wor. Walter L. Mason, and Bro. Earle R. Patnod. Blood donor plaques were given to Donald S. Orrell, 10 gallons; Orrell family, 24 gallons; Donald H. Patnod and Wor. Edward L. Buck, 13 gallons; Wor. Edward W. A. Kilgore, 13 gallons; Elmer O. Christo, 14 gallons; and the Christo family, 25 gallons; Ronald H. Roseniund, 27 gallons; and the Roseniund family, 43 gallons. Pheresis donors: R. W. Richard J. Stewart, 170 pints; Peter G. Stewart, 144 pints. This program was instituted by Wor. 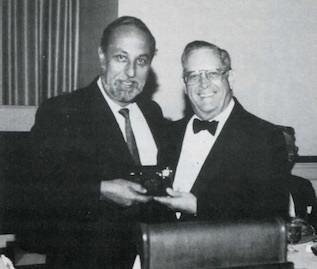 Frank B. Tattersall and spearheaded in the 1970s and '80s by R. W. Richard J. Stewart and the present Chairman Ronald H. Rosenlund, Zone 4B Committeeman for Grand Lodge. Grand Master Darling assisted in presenting the first scholarship awards to ten of the first 17 recipients present, the first given by the Lodge since the fund was started in 1985. Since 1886, when Bro. Samuel Winslow was elected, seven members of the Lodge have served as Mayor of Worcester, the last being Bro. Andrew B. Holmstrom in 1950-53. This page was last modified on 16 September 2017, at 20:27.